In light of the recent study to see if commercial boosters could perform EM-1 mission, could Vulcan ACES launch Orion to lunar orbit with distributed lift on two launches? Would it have the same logistical issues 2 x Delta IV Heavy had? Yes, it could, and no it wouldn't because ACES shoudl be able to loiter in LEO much longer than DCSS or ICPS. Only problem is availability of ACES, since Boeing and Lockheed don't appear to be interested in getting it flying anytime soon. Northrop Grumman will conduct its second qualification test of its 63-inch diameter Graphite Epoxy Motor (GEM 63) in Promontory, Utah. The company developed this new side-mounted rocket motor to add power to the United Launch Alliance (ULA) Atlas V launch vehicle. 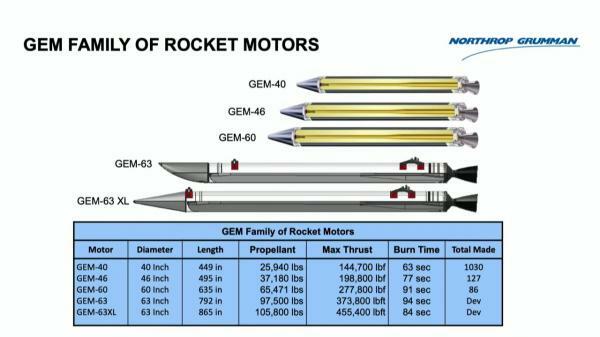 The maximum thrust of the GEM 63 is 373,000 pounds or roughly the equivalent of nine F-35 fighter jets. A public viewing area is available along State Road 83 North approximately 20 miles west of Corinne, Utah (see map – follow directions to Promontory). Please note: It is recommended that you arrive at the viewing site an hour prior to the test. Can't make the test in person? Tune in to our Facebook page at 12:50 p.m. MDT on April 4 to learn more about the motor and watch the test live! BE-4. Thousands of seconds of turbo machinery firing. Over a thousand seconds on the engine at a full scale level. Will acceptance test engines at stand 4670 (used for S-IC in the past) at MSFC. 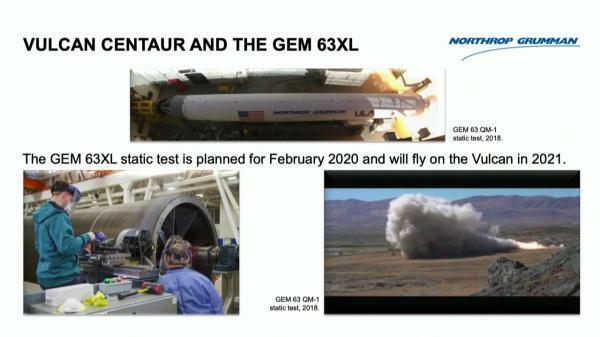 Flying new 5.4 m fairing and GEM63 motors on Atlas V in second quarter of 2020. First two certification missions for the medium (Category A/B) in April and June 2021 flying commercial payloads. First certification mission for Category C in fourth quarter 2023. Complete certification in 2024. ULA's next-generation Vulcan Centaur rocket is purpose built to meet all of the requirements of our nation’s space launch needs and on track to launch in 2021. Filmed in ULA's Decatur, Alabama, factory, this time lapse video shows skin milling of an aluminum panel for a liquid oxygen tank for the Vulcan Centaur's first launch. "at a full-scale level" - how should I interpret this? Also "turbo machinery firing" - does that mean full power pack? Single sides? Stand-alone or as part of an engine? 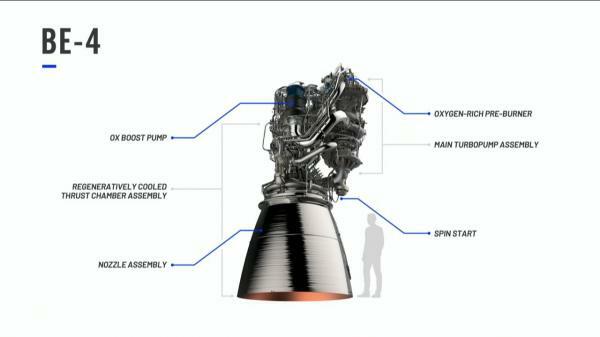 Since the RL-10C-1-1 engine will be used on Atlas V first, when will the engine make its first flight? - actively going through different itérations. - new powerpack test as soon as tomorrow . - qualification engine going to test this summer . So this doesn't quite answer it, right? If powerpacks tests are "as soon as tomorrow", then what has been tested for thousands of seconds? "Actively going through iterations"... As opposed to "passively"? What does "full scale level" mean? The last bullet is more definite, but is forward looking, does not explain what is happening now or has already happened. Well, we're not in the BE-4 thread, so all I am going to say is that we know that the current BE-4 iteration has already reached 80% of the targeted thrust value and is going 100% this summer . Interesting, stats match the RL10c-5-1, am curious to know how the two models will diverge. Not only does it list RL10c-1-1 as an Atlas V engine, it lists RL10c-2-1 as an engine for Delta IV! I haven’t seen an RL10c-2 reference in years, did they finally exhaust the RL10B-2 stockpile? While testing/development maybe behind schedule they should have BE4 flight ready by time its needed in 18months. The video was at times uncomfortable to watch. Really showed how weird the relationship between BO and ULA is. 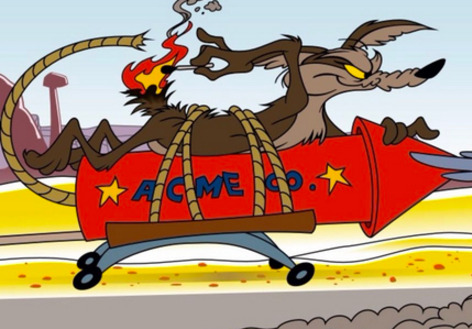 When Mr Bruno said "Some people have certain philosophies about supply chains…..No one can be the best at everything," he made me think of the Coyote. Buying everything from trusted suppliers has worked fine to date, but now Road Runner has arrived on the scene. If the qualification is this summer, it should be ready this year I think. 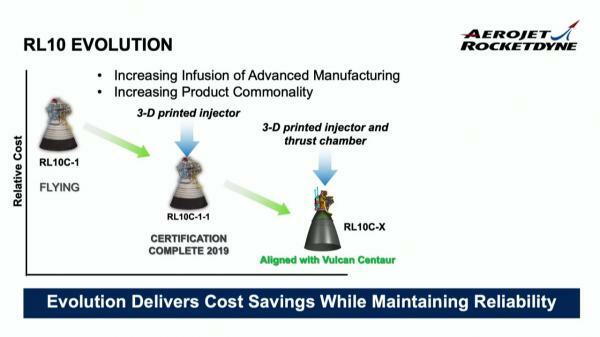 RL10C-2 takes the RL-10C-1 upgrades plus additional upgrades and applies them as an upgrade kit to existing RL-10B-2 stockpile from which the RL-10C family uses. Both RL10C-1 and RL10C-2 can be also be manufactured new however plan all along has been to completely exhaust all existing RL10 engine and parts stockpiles (All Versions) before RL10C-X flies. RL10C-1-1, RL10C-2-1, RL10C-3-1, RL10C-4-1 (on file but not assigned (XEUS version?)) and RL10C-5-1 are all incremental upgrade kits which further replaces original components with optimized 3D printed components. RL-10C-X is the final fully modernized product and is fully optimized for mass reduction, better TWR, and 3D printed, has new optimized channel wall nozzle, MCC et cetera. Now as to current status of stockpiles I don't think that we've fully exhausted them yet.